The latest archeological excavations by the national expedition at Sweida Antiquities Department, which is currently working at the site of the Great Church in Sweida Old City, have unearthed a number of archeological findings which date back to the classical eras. 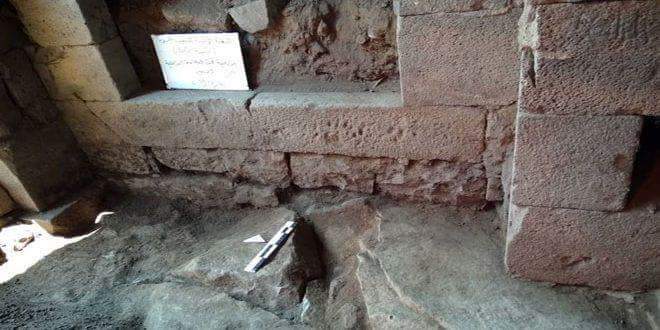 Director of Sweida Antiquities Department Dr. Nashaat Kiwan said that the archeological findings included a foundation floor of a mosaic painting, in addition to some doors and architectural pieces such as crowns, pottery pieces and ancient coins. Kiwan added that the expedition is continuing its work at the site to unearth new archeological artifacts to get more acquainted with the architectural design of the church which is considered as one of the most important archeological monuments in Sweida Old City. He indicated that the expedition also continues its wok at a number of other archeological sites in the city.